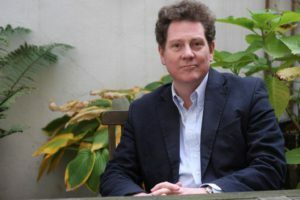 Literary agent and writer Andrew Lownie chaired a session with two renowned biographers of Winston Churchill and explored their approach to an enduring personality. In No More Champagne: Churchill and His Money, David Lough uses Churchill’s own most private records, many never researched before, to chronicle his family’s chronic shortage of money, his own extravagance and his recurring losses from gambling or trading in shares and currencies. Churchill and Empire: A Portrait of an Imperialist by Lawrence James, one of our finest narrative historians, is a genuinely new biography of Winston Churchill, one focusing solely on his relationship with the British Empire. David Lough won an open history scholarship to Oxford University where he gained a first class degree. After an early career in financial markets at home and abroad, he founded a private banking business. He later returned to the world of history, using the experience gained in his private banking career to spend five years researching and piecing together the untold story of Winston Churchill’s precarious personal finances. Lawrence James read for a BA degree at the University of York and an M.Litt at Merton College, Oxford. His books on imperial history in print are’ ‘The Golden Warrior: the life and Legend of Lawrence of Arabia’, ‘The Rise and Fall of the British Empire’, ‘Raj: the Making and Unmaking of Britiish India’, ‘Churchill: Portrait of an Imperialist’ and ‘Empires in the Sun: the Struggle for the Mastery of Africa’. Andrew Lownie made a hugely successful appearance at our 2015 Festival talking about his award-winning Stalin’s Englishman: The Lives of Guy Burgess.